Here at LFBM we’re not averse to giving our themes the occasional night off, especially when there’s a chance to bring you something really special. 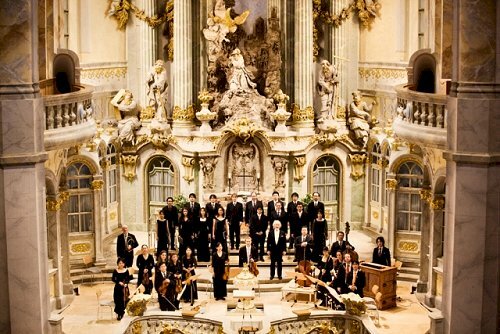 And we certainly think this year’s opening night concert by the Bach Collegium Japan is one of those! Since its foundation by Masaaki Suzuki in 1993, the BCJ has risen to become widely acknowledged as among the very finest interpreters of Bach’s sacred vocal music, yet their visits to the UK have so far been frustratingly rare. It’s with great pleasure, therefore, that we look forward to presenting them in an evening of Bach that includes his two ever-popular double concertos and a pair of cantatas for soprano and orchestra. The soloist in these will be Hana Blažíková, one of the stars of BCJ’s highly praised complete recorded cycle of the Bach cantatas, yet though Hana is most definitely a woman, the music was almost certainly composed for unknown male performers: the beautiful and contemplative ‘Mein Herze schwimmt im Blut’ (BWV199) for a boy in the choir at St Thomas’s Leipzig;and the joyous ‘Jauchzet Gott in allen Landen’ (BWV50) for a castrato! Off-theme? Well maybe. Perhaps we should think of it as women claiming repertoire from the men!